American Journal of Scientific Research and Essays (ISSN:2475-7527, doi:10.28933/ajsre) is a peer reviewed journal publishing research manuscripts, review articles, letters to the editor in Scientific Research. Shanghai Key Lab of Vehicle Aerodynamics and Vehicle Thermal Management, Systems, Tongji Clean Energy Institute of advanced studies- Tongji University. Department of Plant Breeding and Genetics, The University of Agriculture, Peshawar 25130, Khyber Pakhtunkhwa, PAKISTAN. Assistant Professor, The Madura College (Autonomous), Madurai – 625 011, Tamil Nadu, India. Applied Mathematics and Humanities Department, Sardar Vallabhbhai National Institute of Technology. 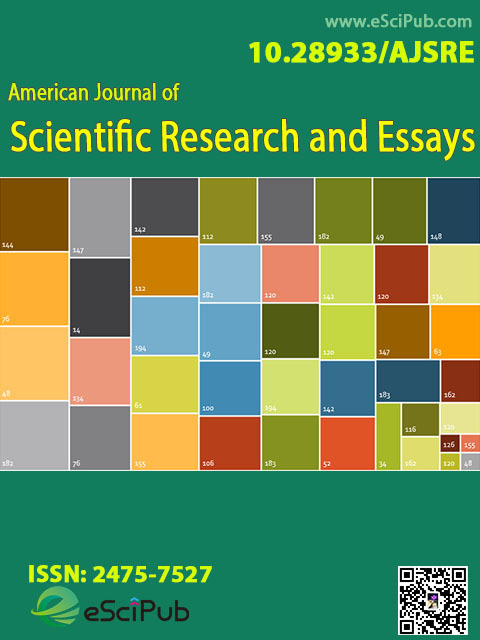 American Journal of Scientific Research and Essays is a peer reviewed open access journal publishing research manuscripts, review articles, editorials, letters to the editor in Scientific Research (Indexing details). Please submit your manuscript by the form below or send it to submit_manuscript@escipub.com (use "American Journal of Scientific Research and Essays" as the email subject line).